Stir and cook onion in butter or margarine until tender. Gently stir in remaining ingredients. Rub fish cavity with pepper and salt. Stuff with Garden Vegetable Stuffing. Close opening with skewers and lace with string. Spoon and remaining stuffing into baking dish. Cover and refrigerate. Heat in oven the last 20 minutes of the fish cooking time before serving. 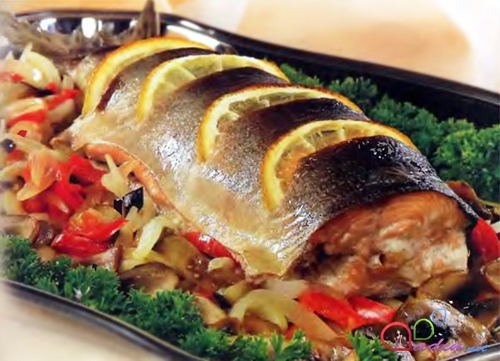 Brush fish with oil and place in shallow roasting pan. Mix lemon juice and butter or margarine. Bake fish 350 degrees uncovered in oven. Brush the fish occasionally with butter or margarine mixture until fish flakes very easily with fork, about 1½ hours. Look for heavy, firm heads of good green color. Remove outside leaves. Wash cabbage. Cut into wedges and shred cabbage with a knife. Give the shredded cabbage a quick rinse. Discard the core. Heat 1 inch (½ inch for shredded cabbage) salted water (½ teaspoon salt to 1 cup water) to boiling. Add cabbage ( and 2 tablespoons of vinegar or lemon juice if using red cabbage). Heat and cover to boiling. Then reduce heat. Boil shredded cabbage for about 5 to 8 minutes until tender and crisp. Then drain. Place steamer basket in ½ inch water (water should not touch bottom of basket). Place cabbage in basket. Cover tightly and heat to boiling. Then reduce heat. Steam until tender and crisp, about 5 to 7 minutes for shredded cabbage. After the cabbage has been cooked, mix flour and sour cream. Heat the remaining ingredients in a 12-inch skillet over medium-high heat until butter or margarine is melted. Add the cabbage and stir and cook until tender but crisp, about 2 to 3 minutes. Stir in sour cream mixture. Place ¼ teaspoon salt, 2 tablespoons water and the cabbage in a 3-quart casserole dish that can be microwave. Cover tightly and microwave on high (100%) 3 minutes. Then stir. Cover tightly and microwave until tender but crisp, about 3 to 5 minutes longer. Then drain. Mix sour cream and flour. Omit the oil. Stir remaining ingredients and sour cream mixture into the cabbage.